In this post, I will try to compare the Learning as a Network (LaaN) perspective/theory (basically a combination of connectivism, complexity theory, and douple-loop learning) to the social constructivism theory. Social Constructivism is a theory of learning based upon the learners' social interaction and collaboration. Social constructivist theorists (e.g. Vygotsky) have extended the traditional focus on individual learning to address collaborative and social dimensions of learning. Whereas Piaget’s cognitive constructivism focuses on the individual mind, Vygotsky's social constructivism conceptualizes learning as more socially constructed. Vygotsky (1978) argues that all cognitive functions originate in, and must therefore be explained as products of, social interactions and that learning was not simply the assimilation and accommodation of new knowledge by learners. According to Vygotsky, human cognitive structures are essentially socially constructed. Knowledge is not simply constructed, it is co-constructed. LaaN differs from social constructivism in four different ways. First, the theory of social constructivism suggests that learners co- construct knowledge. However, the usage of the word “construction” makes from knowledge a robust and durable object. As Latour (2005) states: "using the word 'construction' seemed at first ideal to describe a more realistic version of what it is for anything to stand. And indeed, in all domains, to say that something is constructed has always been associated with an appreciation of its robustness, quality, style, durability, worth, etc" (p. 89). Robustness and durability, however, do not apply to knowledge. Knowledge is much more varied and uncertain. As Siemens (2006) stresses: “In today's world, knowledge life is short; it survives only a short period of time before it is outdated”. In LaaN, knowledge is a personal network rather than an object that can be constructed. Second, although social constructivism takes social interactions into account, it still sees learning as essentially intrinsic (i.e. in the learner's mind). In fact, the primary focus of Vygotsky's social constructivism is to determine the state of a learner's mental development by clarifying its two levels: the actual developmental level and the ZPD. The actual developmental level of a learner indicates her actual mental abilities and the ZPD represents her potential mental development. As Vygotsky (ibid.) puts it: "The actual developmental level characterizes mental development retrospectively, while the zone of proximal development characterizes mental development prospectively" (p. 86). The focus on the mental development of the learner makes thus from social constructivism a learning theory with a primarily psychological perspective. Unlike social constructivism, which views learning as internal developmental processes that result in mental development (i.e. intrinsic), LaaN views learning as both intrinsic and extrinsic; it occurs through the continuous building of personal knowledge networks, at both internal/conceptual and external levels. Third, Vygotsky's social constructivism has centered on the role adults play in fostering children's development. ZPD, which is closely related to the concept of "scaffolding", emphasizes that learning occurs best when an expert (either an adult or a more competent peer; aka the More Knowledgeable Other, MKO) guides a novice from the novice’s current level of knowledge to the level of knowledge the novice reaches in solving problems with assistance. However, nowadays, the lines became blurred between the expert and novice roles. At each moment the novice can get into the expert role and vice versa. In LaaN, everyone is a knowledge networker and can thus act as a novice in one context and step into the expert role in another context. And, in LaaN, the bridge between where the learner is and where she is going is through her personal knowledge network, rather than in the hands of a teacher or a more competent peer. Fourth, the notion of ZPD enables learning which is oriented towards a level of potential development, embodied in the adult or more competent peer. Knowledge, however, is complex and the level of potential development can, thus, never be anticipated or predicted. In LaaN, learning takes place in a knowledge ecology rather than within a ZPD. Unlike a ZPD which is characterized by a rigid, restrictive, and unidirectional development (i.e. training the novices within the ZPD towards a level of potential development), a knowledge ecology is open, multidirectional, and without an end point of development. The boundaries of knowledge ecologies are less fixed and can easily be bridged and merged. And, the development within a knowledge ecology is never fully predetermined and occurs in unpredictable directions. - Latour, B. (2005). Reassembling the Social. An Introduction to Actor-Network-Theory. New York: Oxford University Press. - Siemens, G. (2006). Knowing Knowledge. Knowing Knowledge Wiki. - Vygotsky, L.S. (1978). Mind in Society: The Development of Higher Psychological Processes. Cambridge, MA: Harvard University Press. A video of a conversation with Sergey Brin at the Web 2.0 Summit. Among other subjects, Sergey talked about Twitter, Android, Bing, and Chrome for Mac. Challenges for mashup development today include interoperability, reuse, and automatic service invocation and mediation. In my opinion, model-driven mashup development can provide a potential solution to these challenges. In analogy to model-driven engineering (MDE) as used in software engineering, model-driven mashup development (MDMD) focuses on mashup specification (i.e. creating mashup models) rather than mashup implementation. The figure above depicts how a model-driven approach to mashup development works. 1. The MDMD approach starts with a mashup modeling step, which occurs in a mashup environment neutral manner. In this crucial step, mashups are expressed as models. 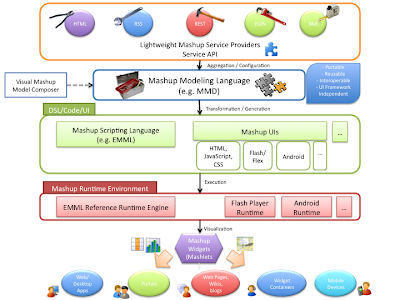 These models define the mashup functionality using a general purpose Mashup Modeling Language (MML). 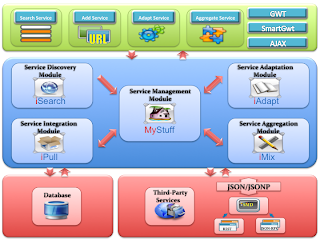 An MML would be used to describe how to call the mashup services (service invocation), what parameters are expected (service input), what parameters are needed for mediation (service mediation), and what to expect in return (service/mashup output). The result of this step are mashup models that are portable, reusable, interoperable, and user interface framework independent. I would propose the Mashup Mapping Description (MMD) as an example of an MML. MMD borrows from the Service Mapping Description (SMD) proposed by Kris Zip to describe RESTful and JSON-RPC services. MMD is a simple and lightweight JSON representation describing RESTful mashups (i.e. mashups of RESTful Web services). Here is an MMD sample that provides a model for the mashup of two popular services, namely Geonames and Google Video Search. It's also possible to think about other mashup modeling languages that are based on other well-established service description specifications, such as WADL and WSDL 2.0 (both are XML-based and are used to describe HTTP-based services). The main advantage of MMD, as compared to a WADL or WSDL 2.0-based MML, is that it uses JSON, which offers several major advantages over XML (less verbose, easier to parse, enables client-based/in-browser mashups, and supports cross-domain Ajax via JSONP). In order to support the mashup modeling step, mashup modeling tools (e.g. Visual Mashup Model Composer) are required to help users create mashup models in an easy and visual manner without the need to get familiar with the MML. This step should be well supported through generic tools that can process the mashup models written in MML and generate human or programmatic interfaces. 3. Once the mashup code/interface is generated and the mashup property values are assigned (in the code/interface), the mashup can then be executed inside a compliant mashup runtime that serves as a mashup demonstration environment (e.g. EMML Reference Runtime Engine, Flash Player Runtime, Android Runtime). 4. Once a mashup is created, it should be possible to provide a view of the mashup in a portable and embeddable mashup widget (aka mashlet). Mashlets are defined by JackBe as "user-oriented micro-applications ... providing the visualization, or “face”, of a mashup to be embedded in a web page". Once a fully functioning mashlet is developed, it can be published, shared, and reused anywhere. It can for instance be embedded into any HTML page, blog, wiki, portal, widget/gadget container (e.g. iGoogle, Apache Shindig), CMS/LMS, social networking platform, enterprise mashup platform, or mobile device. Week 5 of CCK09 was a conference week on Personal Learning Environments & Personal Learning Networks. Different distinguished speakers have presented their views on the topic. The Elluminate recordings are available here. Is a LMS necessary for learning? 10. It comes with a blog! 1. How else would students learn online? The video below provides a good introduction to HTML 5 by Brad Neuberg. Stephen also pointed to another video from Brad Neuberg introducing HTML 5 at Yahoo!. Basically the same content but this time with more interaction. You can find more resources about HTML 5 here. Introduction to HTML 5 from Brad Neuberg on Vimeo. A great slideset by Steve Wheeler who will talk at the PLE/PLN symposium on Thursday. Looking forward to your talk Steve! A symposium will be held from October 13th till October 16th 2009 on Personal Learning Environments (PLEs) and Personal Learning Networks (PLNs). More information (schedule, speakers, etc.) about the symposium can be found here. Looking forward to this interesting event! Here are the slides of my talk last week at the MUPPLE workshop at ECTEL09. You can find the proceedings of the workshop here. In this talk, I mainly introduced the concept of model-driven mashup development and presented PLEF-Ext as a service that leverages the Service Mapping Description (SMD) annotations of RESTful Web services to facilitate the automatic mediation and creation of client-based mashups.This service can be accessed here. Below is a list of popular Web services described with SMD. You can also find here other SMDs by Eric Abouaf. View more documents from Mohamed Amine Chatti. Here are the slides of my talk last week at ECTEL09. The related paper "NetLearn: Social Network Analysis and Visualizations for Learning" is available here. The NetLearn project homepage can be accessed here. Please refer to the help section, in case you encounter problems when running the NetLearn applets. The most valuable and innovative knowledge is hard to find, and it lies within distributed communities and networks. Locating the right community or person who can provide us with exactly the knowledge that we need and who can help us solve exactly the problems that we come upon, can be an efficient way to learn forward. In this paper, we present the details of NetLearn; a service that acts as a knowledge filter for learning. The primary aim of NetLearn is to leverage social network analysis and visualization techniques to help learners mine communities and locate experts that can populate their personal learning environments. View more presentations from Mohamed Amine Chatti. During last week I was attending ECTEL in lovely Nice. It was indeed an excellent event, well organized by the dream team: Katherine, Marcela, Florianne, Clementine, and Sylvie. I witnessed the sleepless nights they had over the last week to make from ECTEL a big success. It was amazing to see how such a big event with more than 300 participants, was organized by a small team of 5 persons. I remember other conferences with much more people on the organization committee, where the result was far less good than ECTEL 2009. Chapeau les filles! On Tuesday, I attended the pre-conference ROLE MUPPLE workshop, well organized by my dear friends Fridolin Wild, Matthias Palmer, Daniel Müller, and Marco Kalz. I presented there our paper "SMashup Personal Learning Environments". You can find the proceedings of the workshop here. I much enjoyed the talks and discussions on how to leverage mashups to develop PLEs and other closely related topics such as widgets and recommendations. I also met great young researchers whom I know well from their blogs and online activities, but I didn't get the chance to meet before, such as Hendrik Drachsler, Behnam Taraghi, and Wolfgang Reinhardt. Hope to get the chance to cooperate with you guys! On Wednesday afternoon, I attended the Future Learning Landscapes workshop, that I organized together with my dear friends Serge Garlatti, Yvan Peter, Marcelo Milrad, and Mike Sharples, who also delivered a very interesting and inspiring keynote talk on the first day of the conference. Thanks a million Serge and Yvan for giving me the chance to work with you. I really enjoyed every moment with you at the conference and I'm looking forward to further collaboration with you in the near future. It was also great to meet Jim Hensman and Amel Bouzeghoub, who also had a nice contribution to the workshop. On Thursday and Friday, I attended some selected sessions at the main conference and presented our other paper "NetLearn: Social Network Analysis and Visualizations for Learning". I will share the slides on Slideshare soon. I listened to several interesting talks at the conference such as the one given by Stefanie Lindstaedt on work-integrated learning environments.